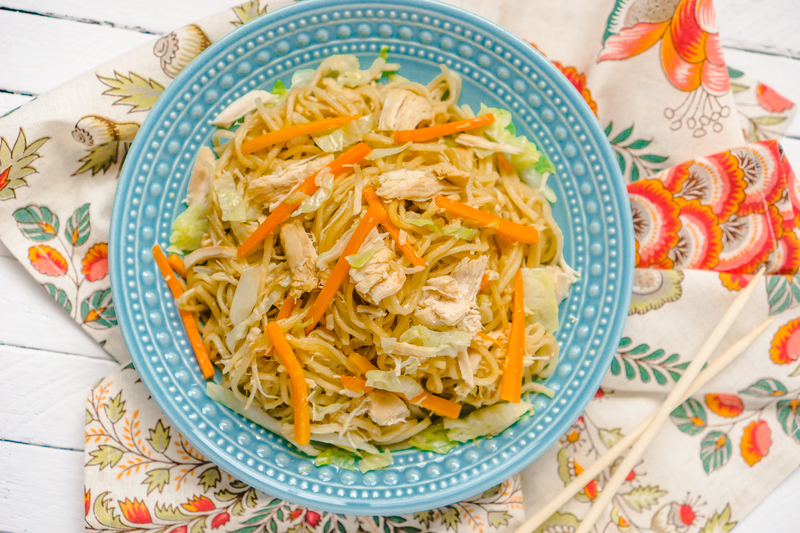 This recipe for homemade chicken lo mein is an easy family dinner the whole family will love! Noodles, vegetables, and soy sauce combine for a light, fresh meal that makes a tasty dinner and leftovers! Easy Chicken Lo Mein recipe filled with veggies! Hi, Nerds! Why does it seem that life perpetually gets busier every year that passes by? I mean, logically, it can’t be true. I don’t necessarily add more to my plate every year. However, logic or not, it is definitely how I feel. It’s the same way that I always know dinner is going to arrive every night, but somehow I always forget and manage to not have time to make half my dinner ideas. But recipes like this Easy Chicken Lo Mein help me solve the dinner problem. This easy dinner idea can be quickly tossed together when you are short on time and long on hungry. You will need cooked chicken in the house so how you want to prepare that might affect your overall cook time for this recipe. Once or twice a month, I cook several chicken breasts in my slow cooker with chicken broth on high for 4 to 6 hours. I use this chicken for recipes like this homemade chicken lo mein as well as buffalo chicken flatbread, chicken and wild rice casserole, or chicken caesar pitas. If you were cooking chicken just for this recipe in the slow cooker, you could also add in some soy sauce or teriyaki to give the chicken extra flavor. Or, if you find yourself really short on time, you could also use rotisserie chicken from the grocery store deli. Making homemade lo mein is not difficult. It requires you to boil some noodles, chop and lightly saute vegetables, and have cooked chicken. That’s it! So here are some things you should know about making chicken lo mein. You do not need any fancy ingredients to make lo mein! You will need vegetables, soy sauce, chicken, and noodles. That’s it. I prefer using a box of lo mein noodles, which I find in the Asian aisle of my normal grocery store, but I have also been known to use a box of spaghetti noodles, egg noodles and ramen as well. 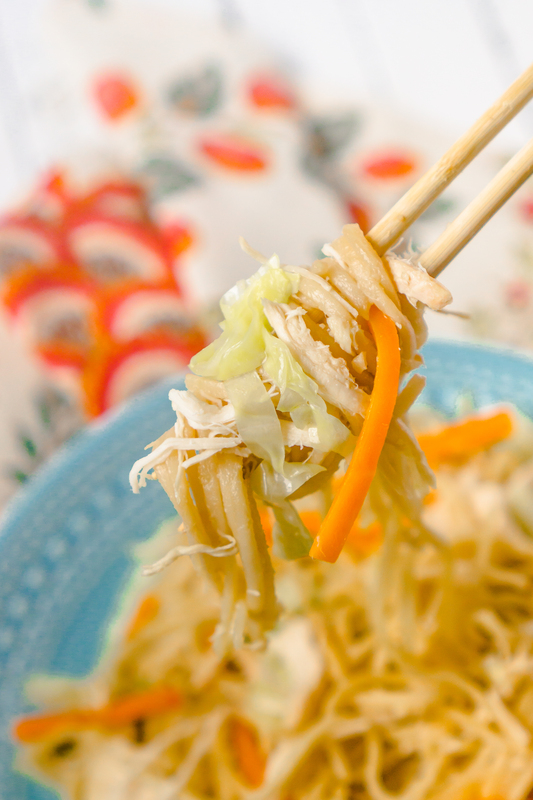 Cabbage, onion, and carrots are used in this lo mein recipe. However, there are lots of vegetables you could use instead, which makes this a perfect recipe for using up vegetables in your fridge before they go bad. For example, you could use also use belle pepper,mushrooms, spinach, broccoli, bok choy, or snap peas. You could also customize this recipe easily for a different protein if you don’t want to use chicken. Consider trying shrimp, fried eggs, beef, pork, or even tofu. Tofu definitely isn’t my thing, though. Now It’s Time to Make a Homemade Chicken Lo Mein Recipe You’ll Love! Recipe originally shared here by Nicole at Simple and Seasonal!